Last Gasp: Summon a 2/2 Rallying Stormcloak in each lane. 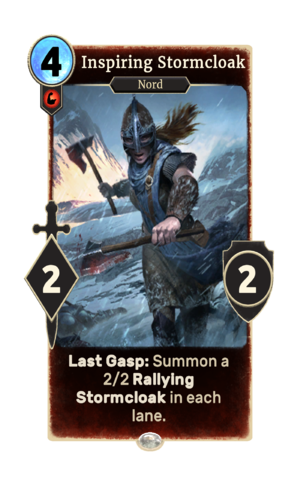 Inspiring Stormcloak is a rare Strength creature card. It is part of the Heroes of Skyrim expansion. "Looks like it falls on my shoulders!" "We'll drive them from our land!" This page was last modified on 9 March 2019, at 16:34.